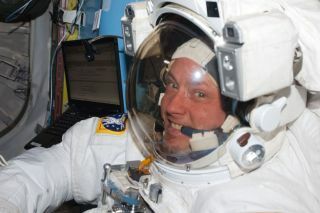 NASA astronaut Michael Fincke, STS-134 mission specialist, attired in an Extravehicular Mobility Unit (EMU) spacesuit, is pictured in the Quest airlock of the International Space Station prior to the start of the mission's third spacewalk on May 25, 2011. HOUSTON – NASA has a new spaceflight champion and his name is Mike Fincke. Fincke, an astronaut flying on the shuttle Endeavour's final mission, broke NASA's all-time record for the most time spent in space by an American late Friday (May 27) when he passed the 377-day mark, and he is raising the bar higher with every additional minute he spends in orbit. NASA's previous record holder for the most days in space is the agency's chief astronaut Peggy Whitson, who spent 376 days, 17 hours and 22 minutes in orbit during two six-month missions to the International Space Station. Fincke, like Whitson, has also served two long-duration stints on the station and is now on this third trip: the 16-day mission of Endeavour's STS-134 flight. "It's certainly an honor to get a chance to fly up in space, and especially for long periods of time," Fincke told reporters in interviews Thursday (May 26). The all-time record for most time spent in space is still held by Russian cosmonaut Sergei Krikalev, who accumulated about 804 days in space over the course of six spaceflights. Krikalev's record is equivalent to more than two years and two months orbiting in the cosmos. Fincke first launched to the station on April 2004 as part of the station's Expedition 9 crew. He spent six months on the orbiting outpost and performed four spacewalks before landing in Kazakhstan in October 2004. Fincke returned to the space station during the Expedition 18 mission, which launched in October 2008. On that mission, Fincke served as station commander. He returned to Earth in April 2009 alongside two crewmates. "I’ve been here at NASA for 14 years. I spent a year in space, but I’ve never launched on, or landed on, a space shuttle before, so it was with great surprise and pleasure that I got assigned to STS-134, commanded by Mark Kelly, and got a really great crew," Fincke said in a preflight interview. Endeavour's mission is NASA's second-to-last shuttle flight before the 30-year-old program is shut down and the orbiter are retired to museums. Endeavour delivered a $2 billion particle physics experiment to the space station, among other supplies, on this flight. A few days after Endeavour blasted off from Kennedy Space Center in Florida on May 16 to begin its final mission before being retired later this year along with the rest NASA's fleet, Fincke summed up the experience from the space station. "It was worth the wait," he said in a video that aired during the day's highlights on NASA TV. Still, Fincke expects that as human exploration and spaceflight continue into the future, these records stand to be broken, especially the missions that aim to push further out into the solar system. "Any records that are happening now – even the greatest on the Russian side of 804 days – that's all going to be long forgotten when humans really start to explore the solar system, especially with some of the new vehicles that NASA is going to come up with," Fincke said. "Six months at a time seems to be what seems to be working now for the space station. Anything longer than that is going to be a little bit tougher, but I think we can live up here relatively indefinitely. A year mission is not out of the question aboard the space station. It would be a lot more interesting to spend a year going to Mars, however."